Michelangelo started his Last Judgement in the upper left hand corner and, over a period of four years, worked his way down through about 250 nudes. Every figure was started with a “comp” — a paper drawing pounced or incised into place. In many cases the faces were started first and lesser elements were passed on to assistants. Surprisingly, many painters today labour from the top down — even landscapes — as if drawing a blind down the canvas. By contrast, Cezanne, as mentioned in the last letter, painted “all at once,” a system readily observed in his unfinished works. Other commendable artists tend to start with a center of interest and work outwards, stroke by stroke. Start with the most difficult area. Your freshness and early patience will help you to get it to your satisfaction and build the confidence to continue. As you move away from the difficult area, which as well is often the center of interest, defocus enhances the focal reality and the freshness of the whole. Start with the foreground or dominant motifs. Compositions fail when the foreground is treated as an afterthought. The foreground is the master of eye control. Elements as they proceed toward the back of the painting can be more arbitrary. Furthermore, it’s often the foreground through which the subject is seen. The foreground is the prompt which invites proceeding — both the eye and the artist. Start with the end in mind. This means getting the whole pattern up early. This is what Cezanne was perhaps after, and definitely got — the materialization of a unique item. With materialization in play you have magic in your fingers and you become the wizard. Esoterica: Paul III brought an associate up the scaffold to pass an opinion on Michelangelo’s half-finished Judgement. Biagio da Cesena said there were ‘too many nudes for such an honored place — more suitable in a bath-house or wine shop.’ Mike continued — he had a written papal guarantee he could do what he wanted. For two hundred years artists were engaged to put breeches on some of the figures. 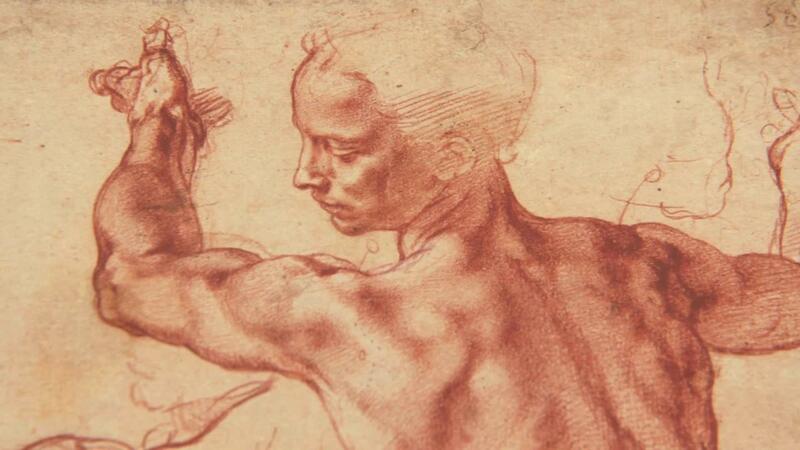 Michelangelo spent a great deal of his energy daydreaming and inventing. He was a great party person and enthusiastic about many things. Unfortunately, he often did not complete his canvases and sometimes didn’t finish his commissions. Had he been solely devoted to his art, the world would have a great deal more to learn from him. It is a shame because his work is so exquisite. What I learned from him was to only devote my major interest in one place. A person must exercise, interact with family, and find a way to pay bills… but when it comes to other types of distraction, I tell myself to stay centered. His obsession with inventing kept him from his art, just like other time not well spent can to us. Benvenuto Cellini, Van Gogh & John William Waterhouse are a few whose life stories have shown me the right attitude to devoting my life’s work to art. It is a difficult thing to do. We must all seek to learn from each other… especially how to keep the right thinking in place for living an art life, what you tell yourself about it, taking criticism, and maintaining enthusiasm regardless. Sometimes I feel that only other artists can fully understand me, we all must lean on each other. I find it interesting that Ion (The tortured Romanian would-be painter living in Canada who wrote a long tale of woe in the last clickback) likes to call his wife and children selfish people. He sounds incredibly selfish. I suppose all artists, or is that “PEOPLE,” are. The only point in his letter that I think is valid is that he and others are the majority and you are the minority (his closing remarks after that long indulgence). Not just in that he cannot make a living much less buy a Bentley, but that he is a selfish mid-life crisis-er who is grasping at and crutching on a teenaged interest in the “mystique” of being an artist and has decided to finally live the life of the martyr he always wanted to be. Really he is far from sacrificing — it appears that all throughout his life he went after what HE wanted — it’s just that he kept changing his mind. Really now he has just committed the ultimate indulgence — to break up his family for the sake of a gnawing whim. I’ve actually started to be aware of my own pattern when it come to my work. I’ve noticed that when I draw the picture out I’ll start with my main figure and won’t stop until I get it close to the way I want it. Then I’ll start on the larger background, but only the basics. Then I’ll focus on the foreground and concentrate on that until I get it nearly drawn completely. Then I’ll add any additional figures and finish the background. Then when I actually start painting (or multimedium layering) I’ll do the background first. Then the foreground. Then the main figure. Then any additional figures. Then I’ll do the finishing touches to all. It’s interesting because my girlfriend told me this is the way I’ve been doing it since she’s known me. But, for me I only started noticing the pattern when I started doing demonstrations of my multimedium layering. My girlfriend says she finds it chaotic. But for me it’s the only way, I guess. What’s important is not where to begin — but to begin. For me, any commitment is the basis of getting going — and it’s the getting going that’s valuable. I watch TV and after a while I just put the paints out and begin, almost as an afterthought. When my brain is relaxed a flow starts on the side and the next thing I know I have art and practically everything I do sells. The next pope, Paul IV, asked Michelangelo to mend his painting. Michelangelo replied, “Tell his supreme holiness that this is a mere trifle and can easily be done; let him mend the world, paintings are easily mended.” He never did mend them. In 1565 Daniele da Volterra draped the figures of St Blaise, St. Catherine, and Adam a secco, a dryer and less penetrating fresco technique, perhaps so that they might be more easily removed if some later pope ever changed his mind. Even though I am a woman I think of myself as a wizard. I even sometimes wear a wizard’s pointed hat around the studio. Stars on it. Knowing you are a wizard makes it possible to concoct lovely things. Wizard is the masculine for witch. I am also one of those — we have a coven of seven of us and two others beside myself are painters and also subscribers of yours so you should know you have witches boiling and bubbling at the other end. Happy Halloween! A few weeks ago one of your friends was wondering what it would be like to do art in an institution like a jail. I am in one and I would like to tell you some of the problems. One is that we can’t have art materials in our living quarters — that is our cells. It all has to be done in the programs room. There are other cons there at any given time and they have radios with the wrong kind of music. There is also a bad attitude among those that are just doing their time. You have to do it very quietly and not make anything about it so that ugly remarks are not made at you — even then you are branded as an outcast. I get my sister to pick up my sculpting and she is storing them because you would not want to keep them around… I hope to do it more when I get out. Also there is nothing to interest you here. Many of these works come from workshops organized in ten prisons by U of M art professors Ann Savageau and Janie Paul and English professor Buzz Alexander. We want to bring your attention to Stephen Dubov, 82661-011, serving a Life Without the Possibility of Parole sentence at a Federal Prison in the U.S.A. Dubov was convicted, in 1988, of cocaine possession. There was no violence. The only victim was himself. He is now 55 years old, and has been incarcerated for over twelve years. A website was initiated and is maintained by “Friends of Stephen Dubov,” an informal coalition of Dubov’s supporters. Dubov has no access or control over the site and does not benefit in any material way from the information presented in it. Dubov himself has no access to the art scene, to his own exhibits and shows, to the Internet, or to the world outside — except through personal visits and the postal service. For starters I am about to start my first painting. It is going to be of a rooster. I got the paints for Christmas and am just now getting them out. Do you think I should start with the head? Wish me luck. (RG note) The head would be a good place to start. Don’t leave out the roosterness.